Flush with a fresh round of funding, GitHub is gearing up for a round of expansion as a business. But how is GitHub -- the service, not the company -- poised to evolve? By all appearances, it won't be GitHub itself that pioneers novel uses for its service. Instead, third parties will build those services with GitHub in new ways -- not only by back-ending into GitHub, but by transforming GitHub's Web-based user interface as well. ZenHub is one recent example. Its product, now expanding to encompass the on-premises enterprise edition of GitHub, adds collaboration and project management tools directly to the GitHub interface. 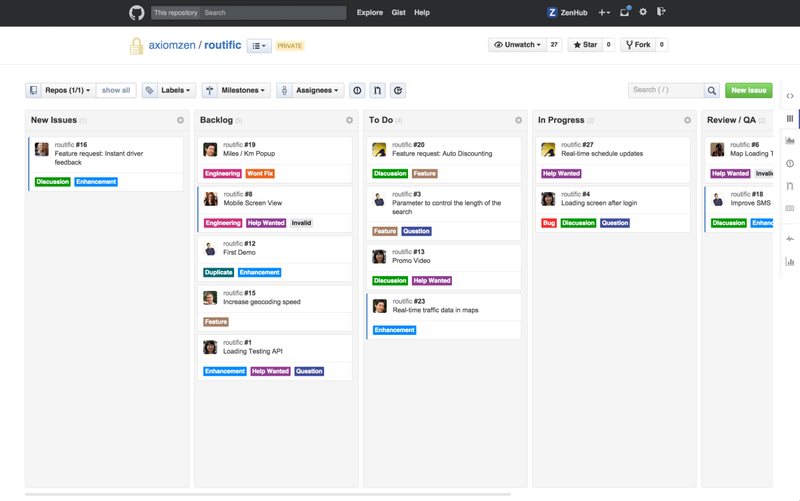 Kanban-style multirepository task boards, velocity tracking, burndown charts, and other features all show up within GitHub, rather than in a separate application. "Our competitors can be integrated with GitHub," said ZenHub co-founder Matthew Butler in a phone call, "but not present within GitHub itself." This also helps, in his view, to make GitHub less intimidating for project managers. The exact way ZenHub integrates into the GitHub interface is also telling. GitHub doesn't provide APIs that allow for direct manipulation of its UI. To make this possible, ZenHub uses a browser add-on for Google Chrome. A task board in ZenHub, integrated directly into the GitHub Enterprise Web interface by way of a Chrome plug-in. GitHub is considering more official guidelines about how to let third-party applications transform its product's UIs. ZenHub isn't the only GitHub-enabled third-party service that does this sort. For example, Harvest is a time-tracking tool that uses a Chrome add-on for integration with GitHub and other services. That said, ZenHub is likely to be the only of the bunch so far that integrates this closely and thoroughly with GitHub's main UI. Given that a big part of GitHub's appeal is its UI, what does GitHub think about having third parties modifying the interface in this manner? Joe Wadcan, head of business development at GitHub, noted that right now, the company doesn't yet have explicit guidelines for how to accomplish this, but it's "definitely something we're working on." GitHub has guidelines about logo usage and how to deploy marketing assets, but when it comes to modifying the UI itself, "we're going to be releasing something a little bit more detailed around different use cases," although no time frame was given. Right now, the companies building on top of GitHub seem to be working from the principle of asking forgiveness rather than permission. In ZenHub's case, the company "hadn't directly communicated" with GitHub beforehand, "so we're looking to see what they come up with as well." Another point GitHub has stressed, both now and in the past, is that it wants to remain focused on developer workflow. The company has been reluctant to have GitHub more directly embrace the way it's used for tasks other than programming, preferring instead to let the work be done either ad hoc or by way of the existing GitHub API set. That said, Wadcan added, the company is "open to discussing deeper integrations larger than simple API calls," a way to "keep ourselves open-minded so that we're not limiting our ecosystem." This story, "GitHub's next big innovations won't come from GitHub" was originally published by InfoWorld.